The OECD is an international economic organisation of 34 countries founded in 1961 to stimulate economic progress and world trade. It defines itself as a forum of countries committed to democracy and the market economy, providing a platform to compare policy experiences, seeking answers to common problems, identifying good practices, and co-ordinating domestic and international policies of its members. Its headquartered in Paris, France. 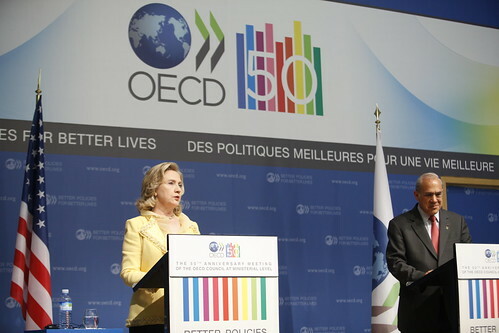 During celebration of 50th anniversary of its establishment, the OECD adopted a new logo and it is also used on its new flag. New logo is a blue disc charged with white map of the continents (reducing the size of the Pacific Ocean), and the two green and grey coloured arrowheads point towards the fly (instead of hoist, as it was used on previous flag). The new logo was adopted on 15 December 2010. This logo can be seen on OECD web pages, e.g., at http://www.oecd.org/home/0,2987,en_2649_201185_1_1_1_1_1,00.html.